Level 2: Supporting PCs in the enterprise A few things I've learned supporting PC's in the enterprise. This blog is primarily focused on SCCM but also group policy, application support, etc..
Our company has been rolling out Surface Pro 3 devices for several months now. We use SCCM with MDT integration to image these devices and we integrate the latest driver and firmware packages as part of the build process. 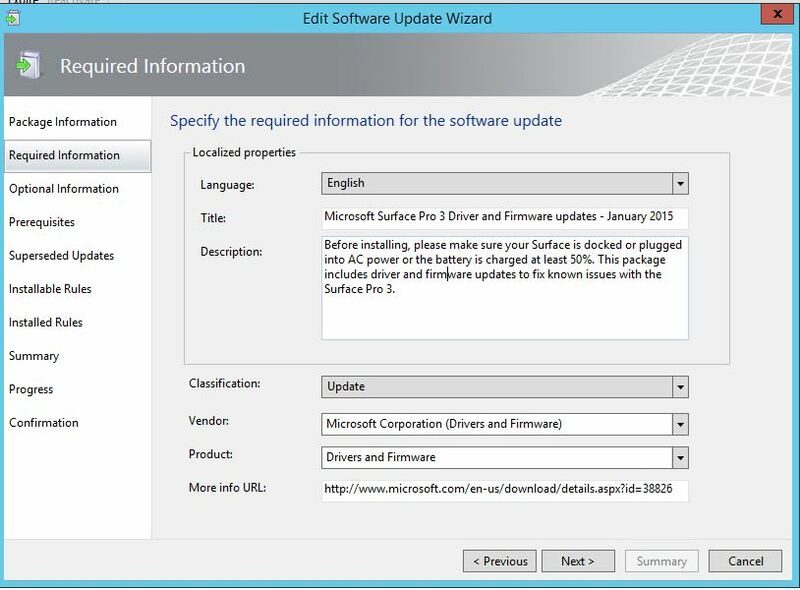 As we deployed more Surface Pro 3’s, it was clear that we needed an automated method to update firmware and drivers. We started down the path of creating an application in SCCM but preferred to update our Surface Pro 3’s during monthly patches so we didn’t create an extra reboot for our end users. I discovered you can use SCUP to deliver Surface Pro 3 drivers and firmware updates as part of your monthly patch process. In the past, it was difficult to do this but as it turns out, Microsoft recently released an .MSI package that installs the latest Surface Pro 3 drivers and firmware making our job much easier. Download WinRAR, use IExpress.exe or use an alternative self extracting program. 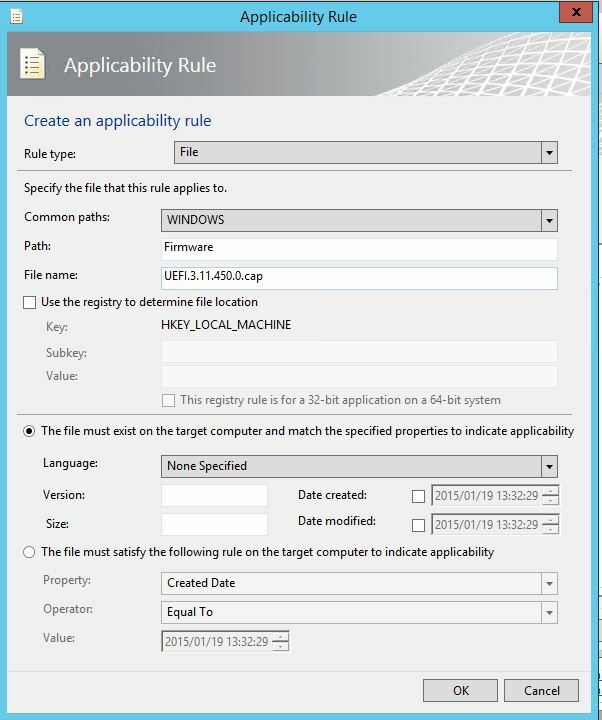 Create a folder named SurfacePro3_15_01_1. I chose this folder name as it matches the .MSI file name for this month and will easily be identifiable as time goes on. Place the downloaded .MSI file in this folder. On the Modes tab, ensure the Hide all radio button is selected. On the Update tab, ensure the Extract and replace files and Overwrite all files radio button is selected. I recommend to test the packaged .exe on a test VM before proceeding. It’s much easier to get any issues corrected now rather than to find out after you publish it with SCUP. Create a new Software Update in your newly created product group. On Installable Rules screen click on the star icon to add a new rule. 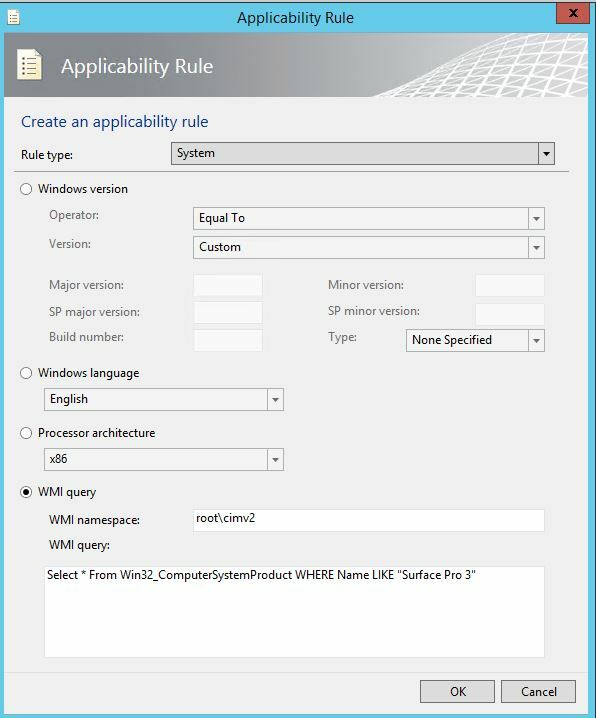 This WMI query ensures that this package is only intended for Surface Pro 3 computers. 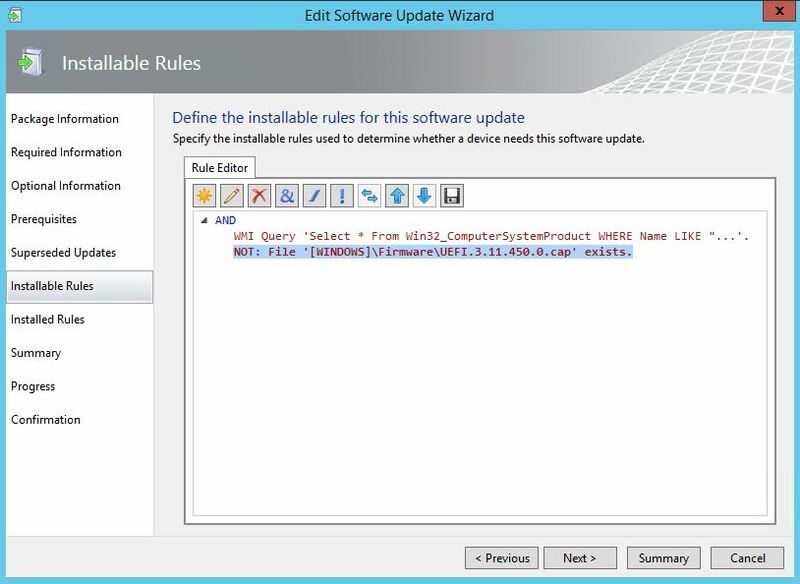 While still in the Installable Rules click on the star icon to add another rule. 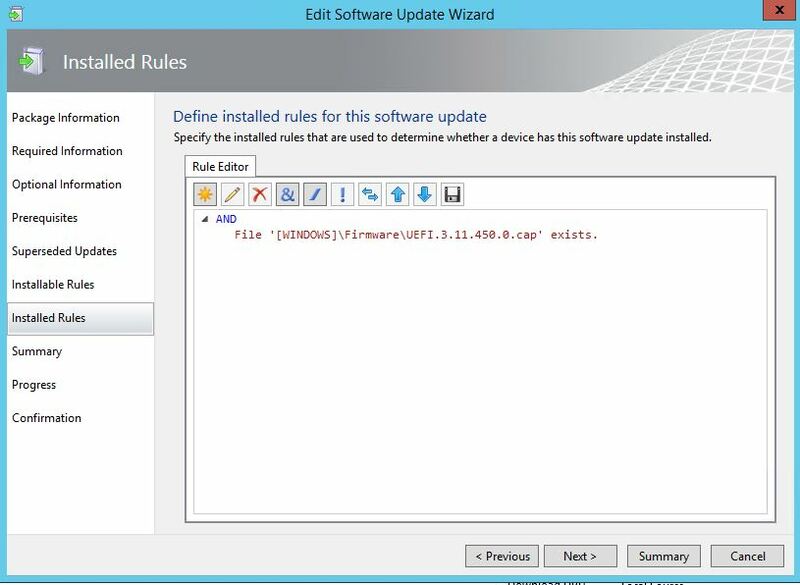 On the Installed Rules screen, click the star icon to add a rule. Review the summary screen and click Next and then Close. Publish this update with SCUP and then synchronize your Software Update point. 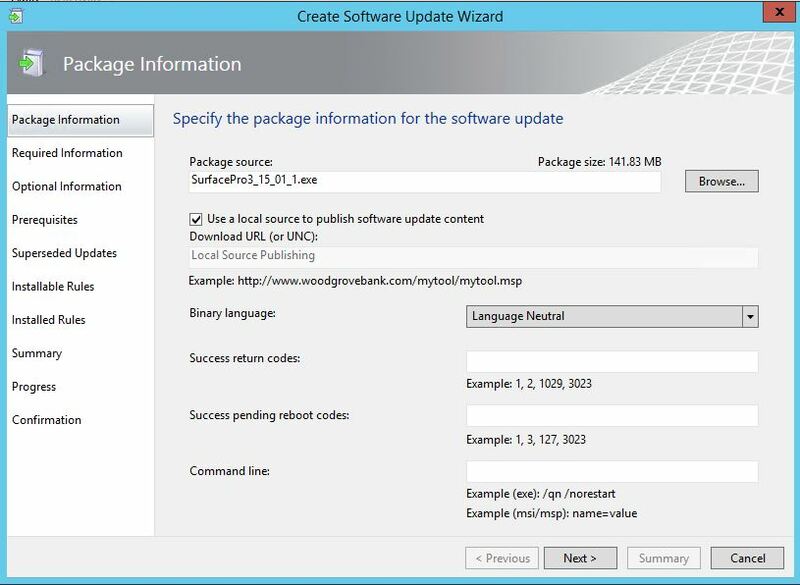 If your new update doesn’t appear in All Software Updates you may need to add your new product under SCCM>Administration>Site Configuration>Sites>Site Server name>Configure Site Components>Software Update Point>Products, then synchronize again. 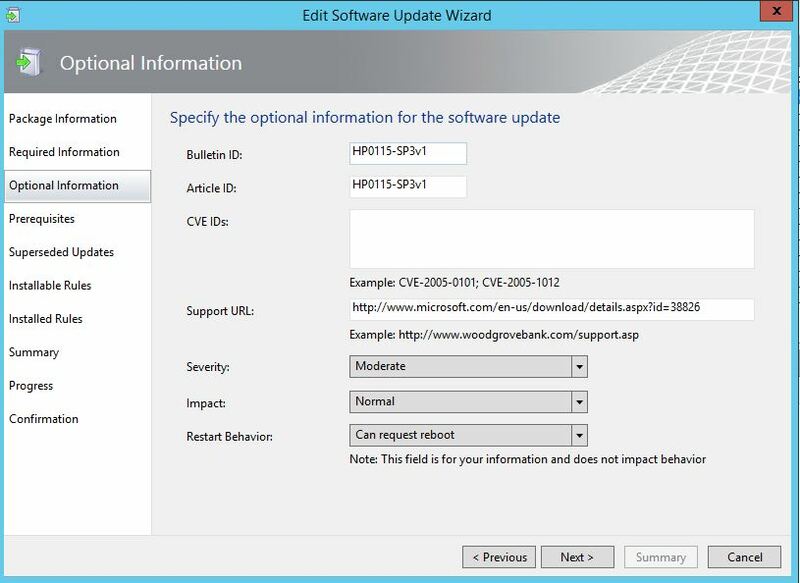 Add your new update to a test Software Update Group, deploy and test. Hope this helps in getting your Surface Pro 3’s up to date. Good post. Do you mind if I use part of it in a post I am writing at sunbehindtheclouds.com? I will obviously cite you as the original author and link your post. No problem on using some of it on sunbehindtheclouds.com. Thanks for asking.